Verona may be the setting of the greatest love story in history, but it’s also one of the most prosperous cities in Northern Italy. Inspired by the rich heritage and romanticism of the city, our Verona silk dressing gowns vary from season to season but always feature a modern pattern with sumptuous silk jacquard texture. Created in-house in our London studio, where an original design is drawn by hand, the Verona 40 jacquard pattern features an Indian paisley pattern. This simple but beautiful motif is embroidered throughout the gown using a navy blue thread. 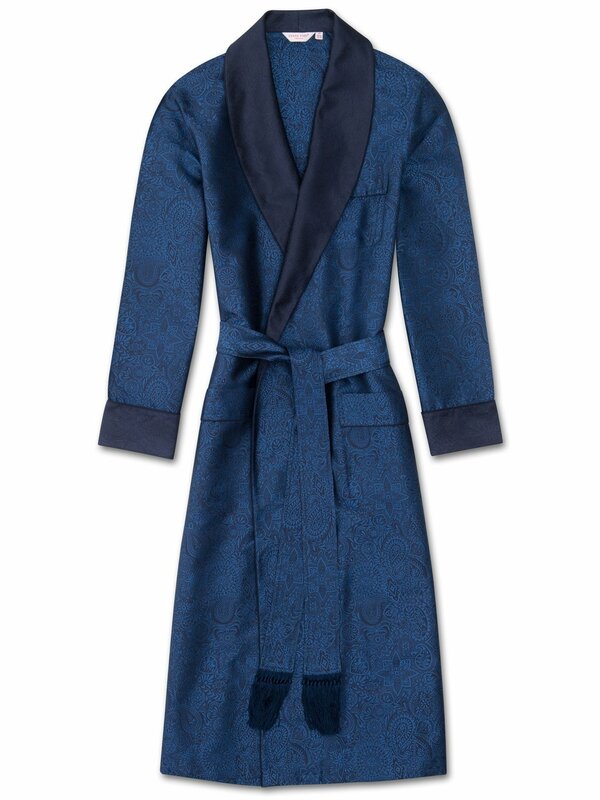 Handmade in our workshop in Cheshire, England, the 100% pure silk Verona 40 tasseled belt dressing gown in blue is produced in extremely limited quantities. The result of hours of loving craftwork by our skilled pattern cutters and seamstresses, you're sure to feel like royalty while relaxing in this luxurious gown. The Derek Rose dressing gown features a classic, generous cut and length, for both elegance and comfort. Made to a specification first developed by Mr Derek Rose decades ago and refined over the years, the gown features a traditional shawl collar, rifle cuffs and breast and side pockets and merges classic styling with a modern fabric design. This garment has also been fully piped by hand in a complementary navy blue piping and finished with a matching tasseled belt for an added touch of luxe.